2004 – I was still living in Arkansas. I dressed as Marilyn Monroe from “Gentlemen Prefer Blondes,” and I was a blonde! Coincidently I met up at a party where I met Jackie-O and a very bloody JFK (My friends Chris and Su-Lauren). 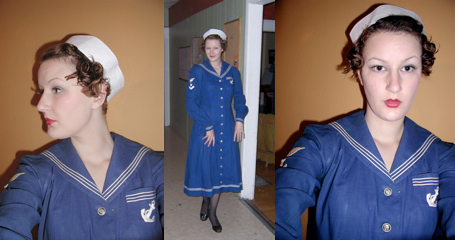 2005 – I had just moved to Eugene, Oregon for graduate school and dressed as a little sailor girl in this vintage sailor dress. I didn’t know anyone in the city, save for the 13 people I lived with in my co-op house. We went to a party at another co-op and taught our Chinese roommate American slang. 2006 – I could find no record of dressing up for this year. I think I was too swamped in graduate school work to dress up! 2007 – I lived in Portland at this time. I worked part time in a vintage store downtown, and I acted as a living mannequin outside of the shop with a candy dish in my hand. I found that I was quite good at standing still – and I scared quite a few passers by. My actual Halloween that year was quite strange. I didn’t have many (any) friends in Portland, and I ended up meeting up with a group of folks who were all dressed as Nintendo characters, and we played video games at Ground Kontrol Arcade. 2008 – “Silent film star who is actually silent and only communicates through title cards.” I spent two weeks watching silent movies and photographing the title cards, and I shuffled them around to talk – an exersize in Dada if there ever was one. A year or two before this, Julia had concocted this same costume, and I freely admit that I appropriated it from her 🙂 This year, I waited in line for hours to get into Gadjo Disko! and never got in – settled on eating cupcakes and drinking whiskey instead. 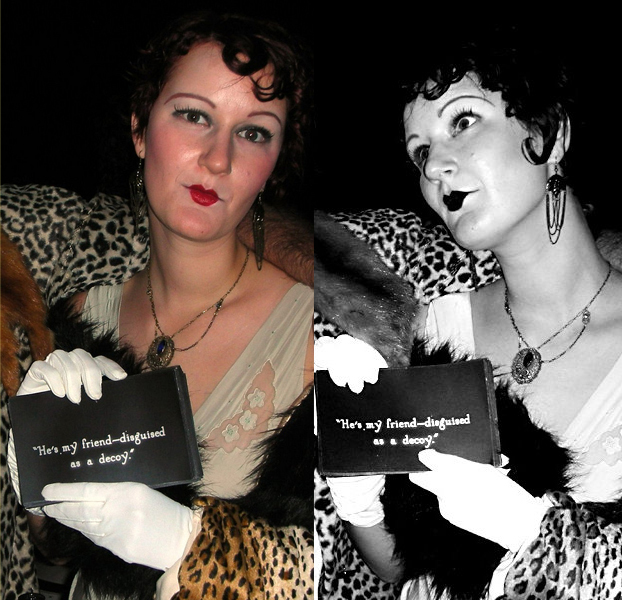 2009 – Belleweather and I dressed as Siamese twins Violet and Daisy Hilton from Freaks. When we went out, we tied a ribbon around ourselves to stay together in crowds. This was the first year that I saw the White Ghost Shivers for Halloween. 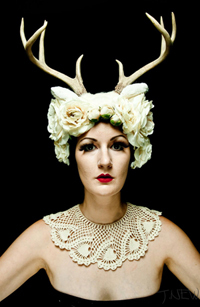 2010 – “Deer de los Muertos” costume, with skull makeup, antler headband, rotting 1920s lace as a scarf, and lots of roses. I went to the East Side Show room to see the White Ghost Shivers play a secret Sinking-of-the-Titanic themed show. 2011 – Windup Doll. What in the world was this costume?! It was a mashup of Egyptian, Steampunk, and living Dolly. I painstakingly refashioned a Tim Bird as a necklace, and he actually flapped! The hoop skirt was constructed out of goodies from the hardware aisle, including threaded bolts, irrigation tubing, and lots of spray paint. I did also see White Ghost Shivers again for Halloween proper, but I had a much more subdued outfit on – one that could move in a crowd. You know how to have fun!